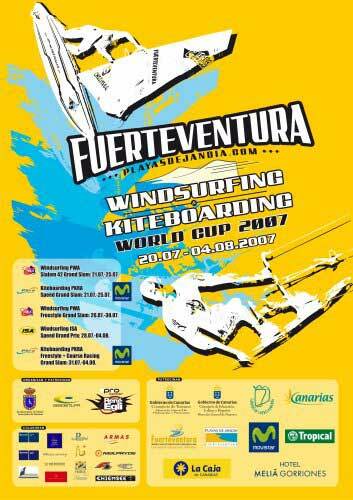 The first day without Calima wind brought almost perfect flat conditions on the water, but not windwise. With 22-25 knots it was just sailable on an angle of app. 135 degrees.This is normally my nightmare conditions with slow speeds. So I am very pleased to be lying 2nd to Karin who achieved an impressive 33.25 with me just behind on 32.51. In the Mens fleet lead changed between Bjorn, Finian, Jose and Antoine in the beginning, but Finian had some fast runs with a top speed of 37.34 knots. In the end, this was the fastest speed recorded, and he was able to hold back Antoine to second place and Jose into third. Cyril finished fourth and Bjorn fifth, but we are sure that he will strike back. A disappointing day for me with two 3rds and a top speed of 34.13, I was hoping to make some ground on Valarie & Karin in the stronger winds but I was just over a knot off the pace. Their two weeks prior slalom racing here has really made a difference. Great wind 30 plus knots but way too broad at 150 deg, they started a heat but the times were very slow and only half the sailors were making the course. I managed one run before they called it off. The wind was very close to comp speed all day, and they called it at the very last min 5.30. I managed a top speed of 32k (still about a knot off the professionals Karin & Valerie) which ensured my 3rd place overall, my best at this venue. At the start of leg 5 it looked pretty light and gusty, but the conditions got better by the minute. Finian Maynard had a black day, finishing only 5th in the 1st heat, and Diethelm, Albeau, Dunkerbeck making points and threatening his 1st place. Dan Ellis our highest placed Brit did very well with a 5th place moving him up to 9th overall. With the wind building to almost 40 knots on the strip, the race director called for another race. Up to that point, it still looked OK for Finian, but it was time now to go for the title. In the women’s fleet Valerie took another victory, and suddenly it became close for Karin’s 1st place too. 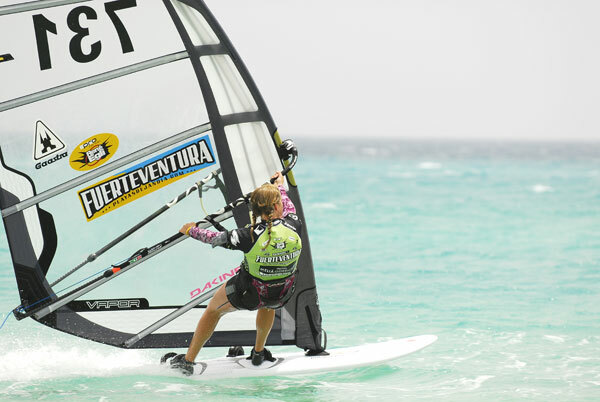 Valerie needed another bullet and a new women’s top speed to equal points and take the Fuerteventura crown. So race 6 went into sequence, and the speeds were again around 39-40 knots. Bjorn Dunkerbeck was the man of the day, with 40.18 knots and he scored the fastest time of the week. Antoine took the lead, Patrick in third and Finian finishing only 4th again. Valerie took the victory in this race, but was not able to set a new top speed for the women’s fleet, so Karin and Valerie were on same points and only Karin’s higher top speed gave her the event. For the men’s fleet, Finian only managed a fourth place which dropped him from first to third, Antoine went up from 4th to win the event with Patrick keeping second place. So the men’s & women’s event title went in the last minutes of the final day of the competition. It couldn't have been any closer. I am now looking forward for the final event of the 2007 season, which will take place from 2nd of September until 11th of September in Walvis Bay, Namibia. 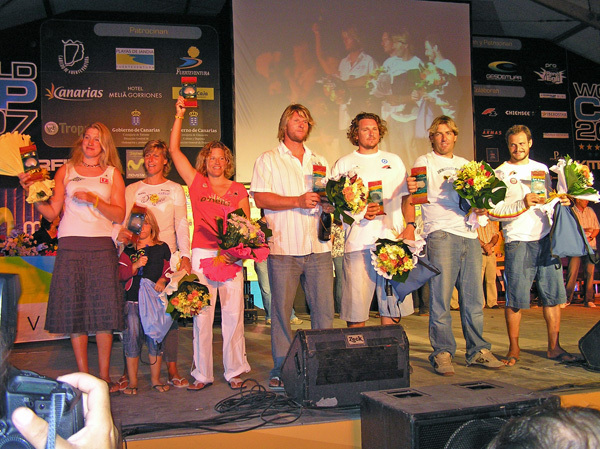 The decider for the overall title between Antoine Albeau and Finian Maynard, and Valerie and Karin will be decided there for the 2007 titles. The best I can achieve now is a possible 2nd. Namibia is more my conditions and I’m hoping to improve my British 500 and world mile records. Finally much thanks to Atan boots which I used all the competition in Fuerte and they felt like being in bare feet, but protected my feet and I came away with no blisters, hurrah!